A fresh new look is coming soon. Our interior will be undergoing renovations until June 30- 2016. If we can do anything to make your stay more comfortable during this time- please let us know. This Property is 100 Pct. Non-Smoking The Hampton Inn San Antonio-Northwoods hotel is located on the north side of San Antonio Texas close to Sea World and Six Flags Fiesta Texas. 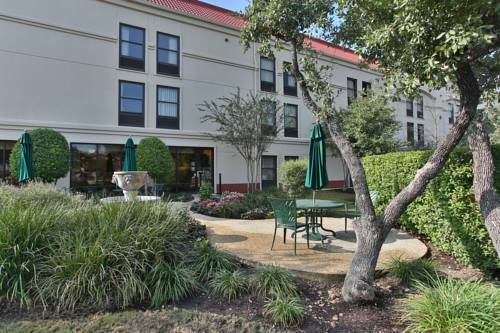 With easy access to I-35 and I-H10 our hotel is surrounded by many major businesses fantastic restaurants great shopping the Medical Center and the University of Texas San Antonio. We offer the following complimentary amenities our daily On the House hot breakfast high-speed internet access local phone calls parking and daily newspaper. All rooms of the Hampton Inn San Antonio-Northwoods hotel are equipped with a coffeemaker hair dryer iron and ironing board. A fitness center guest laundry and outdoor pool are also available at our hotel We love having you here in Texas at the Hampton Inn San Antonio-Northwoods.